With the England team known for crashing out of the World Cup extremely early in the competition, it is always handy to have a second team that you're routing for in the games. With so many games kicking off at once, it is very easy to lose track of recent results and know who is still in the game. Here at the Champions Football Speakers agency, we've created a World Cup calendar and sweepstake so that you and your co-workers are always up to date on who's still in. A sweepstake not only offers an alternative team to support, but a fun opportunity to get everybody from the office embracing the spirit of sport and friendly competition. An extremely prestigious and anticipated international event, the World Cup brings together the world in what truly is what sport is all about. With teams participating from all four corners of the globe, it gives both football players and countries the chance to stand out from the crowd on the world stage. 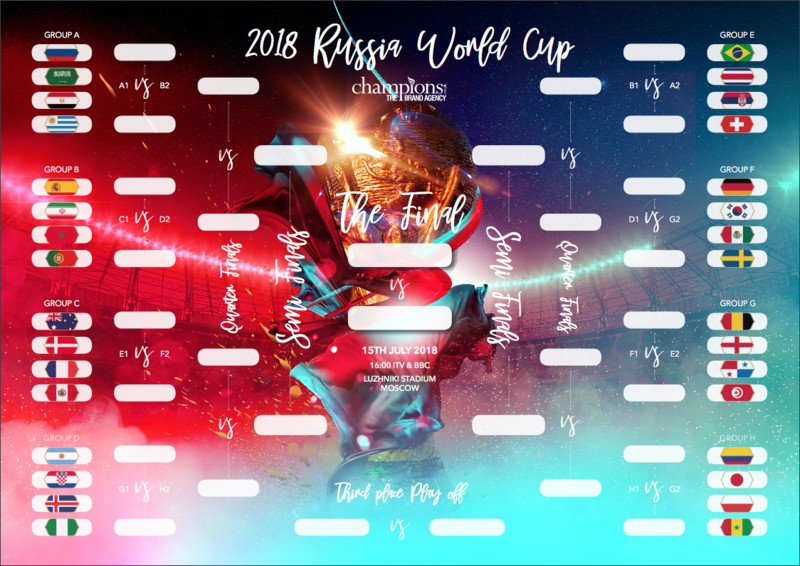 Our free world cup calendar allows you to keep up to date on the latest goings on from Russia, and involves the whole office in the competition. 1. Download and print our World Cup Calendar & Sweepstake kit on this page above. Make sure you select the correct size for your printer. We recommend the bigger sizes, but A4 still suffices. 2. Write all of the team names down on a piece of paper and cut them into little slips of paper. Put the names in a hat, bowl or jar and shuffle them up. Ensure that all the names are shuffled well and cannot be seen by the person picking them out. Once this is done, find out who has what team and write this information on our secondary sheet, next to the team that the person got. 3. Choose your final prize- pick a prize that the winner will win. Everybody could put £1 in a pot that the winner receives or a treat such as some chocolate, a lunch or something similar could all be the grand prize for the final. 4. Once the group stages have passed, begin writing the fixtures and results on the calendar sheet. This will ensure that you are all up to date. 5. Wait for the winner!